This weekend I decided to try my hand at making a classic English dessert. 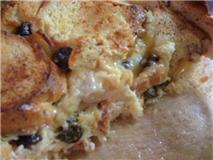 Bread and butter pudding is a great (and tasty) way of using up stale leftover bread. Usually it is associated with school dinners but the history of this dessert can be traced back to the 18th century. I decided to use Delia Smith’s recipe for Rich Bread and Butter Pudding but I made a few adjustments. This is an easy and fun recipe to play around with. Different types of bread can be used such as a sesame seed loaf (which I used) or regular sliced white or wholemeal sandwich bread. Using something like a chocolate or almond brioche would make this dish extra special. Dried fruits, different spices as well as jams and marmalade can also be used to add extra flavour and textures to the dish. 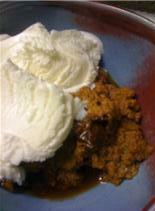 I decided to add a half cup of raisins that had been soaked in Cointreau for about 24 hours which gave the pudding a nice boozy hit. It could have been the few boozy raisins I sampled or the glass of Cointreau I had on the side but I threw caution to the wind and decided to make my own custard to go with the pudding. I found a great recipe by Merrilees Parker which looked perfect for a custard making novice like myself. 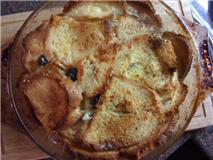 While the bread and butter pudding came out beautifully, my first attempt at custard was not a success. I made the mistake of allowing the milk to get too hot. Even though I added it very slowly to the egg mixture it was so hot it actually cooked the eggs, resulting in a scrambled unappetizing mess. So I started again (luckily it’s a very quick recipe) and managed to get it right. It was a lovely accompaniment to the bread and butter pudding but to be fair I may add a touch more vanilla essence next time and allow it to thicken just a wee bit more. I was probably being over cautious as the thought of a third attempt was not appealing. If custard isn’t your thing then you can always pour double cream over the top or serve the pudding with a generous scoop of vanilla ice cream. Bread and butter pudding is quite moist inside so you can actually eat it without any ‘extras’ on top – it just depends on how decadent you’re feeling! So have a go at this easy recipe. It’s the perfect dessert for a lazy weekend! 3. Next, in a glass measuring jug, measure out the milk and add the double cream. 5. Pour the whole lot over the bread, sprinkle over some freshly grated nutmeg, and bake in the oven for 30-40 minutes. 1. Heat the milk with the vanilla pod and allow it to just come to the boil. In a large bowl, beat the eggs with the sugar. 2. Pour the hot milk over the egg yolks whisking vigorously. When completely mixed in, return to the pan. 3. Stir over a low heat until the mixture thickens sufficiently to coat the back of a spoon. This will take 5-6 minutes. 4. Drain into a bowl, remove vanilla pod (or add essence if using). Thinking back on my childhood, one of the things I remember from this time of year was my Mum making a dessert known as Indian Pudding. There was nothing quite like playing outside in the crisp Autumn air – jumping in piles of leaves and playing make believe in the back yard – and then coming inside to this wonderful dish. The spicy aroma and deep smoky flavour of molasses take me right back to those happy childhood memories. The origins of Indian Pudding come from Colonial America where the settlers attempted to recreate dishes from their homelands. 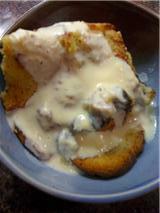 It is very similar to porridge and also to what is known in the U.K as hasty pudding. Cereal grains (usually wheat or oats) would be boiled down over a long period of time in scalded milk, resulting in a thick creamy consistency (no lumps please!). Not having access to large stores of wheat or oats the colonists used cornmeal instead which was more readily available. Often butter or beaten eggs would be added to give the dish extra richness. Spices such as Cinnamon, Ginger and Nutmeg would be used to enhance the flavour and it would be sweetened with molasses. Dried fruits were also occasionally added. For me this creamy dessert conjures up happy childhood memories (and Autumn) just as much as a big slice of pumpkin pie. Preheat oven to 150 degrees Celsius (300 degrees F). Heavily grease a 1-1/2 quart oven proof baking dish with unsalted butter. Place 3/4 cup water in a small bowl and gradually whisk in the cornmeal until it is completely mixed and smooth. Scald 3 cups of the milk in a heavy saucepan (heat until tiny bubbles appear around the edge). Make sure you don’t bring the milk to a full boil. Stir the cornmeal mixture into the hot milk. Reduce heat to low and stir frequently, for approximately 15 minutes, or until the mixture has thickened. Return the egg and cornmeal mixture to the saucepan and stir in the sugar, molasses, butter, cinnamon, ginger, nutmeg and salt. You can add dried fruit at this stage if you want. Pour the mixture into the prepared greased dish and bake for 30 minutes. Remove from oven and gently pour the remaining 1 cup of milk over the top of the pudding. Do not stir in. Continue to bake for approximately 2 1/2 to 3 hours or until the pudding begins to set. Remove from oven and set aside for 30 minutes to one hour. It will continue to thicken further as it cools. Serve warm, topped with vanilla ice cream. Note: This recipe serves 5-6 but I love to have the leftovers for breakfast the next day – slightly warmed and served with milk. YUMMY! Zucchini or courgette is what is known as a summer squash. 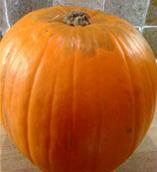 It has a lighter texture and more delicate flavour then some of the heavier winter squashes. Looking like a greener more rugged cucumber the zucchini is an incredibly versatile vegetable. They can be eaten steamed, grilled, baked or fried. They can be stuffed. They can be grated into pasta. They are also wonderful additions to stews and curries. 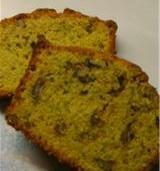 For me one of the tastiest ways to use zucchini is in baking. 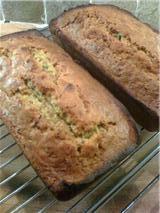 This recipe for zucchini bread is one of my tried and true all time favourites. It is moist, not too sweet and goes very well with a hot cup of tea. The addition of walnuts adds a little extra kitchen witch magic! This really is a very simple recipe and kids will love it. It’s a great way to get them to eat some veggies! If you’ve never tried it – give it a go. You will never see a zucchini in the same way again! Bake for approx 60 – 70 minutes or until a knife inserted into the centre, comes out clean. I cover the loaves with tinfoil about ¾ of the way through cooking to make sure they don’t brown too much on top. Slice it up and enjoy with a cup of tea and a good book! Pumpkins ARE magical. They have pleasing shapes, are beautiful shades of orange and they smell of Autumn when you cut into them. Of course one of the best things about pumpkins is the way they taste! There are so many wonderful things you can create with pumpkins – never mind carving them into Jack O’Lanterns! I am saddened by how many people throw away the seeds when they are carving their pumpkins. These seeds are not only good for you – they are absolutely delicious. All you need to do is clean them off and pop them in the oven for 20 minutes or so and presto – you have a snack that you won’t want to share with anybody else! 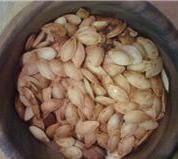 Luna Raye’s Perfect Roasted Pumpkin Seeds. While you’re scooping all the gloop out of your pumpkin make sure to have a bowl handy in which you can reserve the seeds. Preheat the oven to 150 degrees. When you are finished with your pumpkin (carving it or preparing the flesh for a recipe) go back to the seeds and clean off as much of the gloop as you can, but don’t be too worried if there is a small amount left around the seeds. 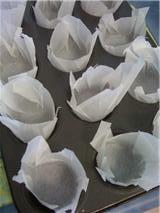 Line a baking tray with parchment paper and spread the seeds out. Lightly salt them and put in the oven. There is no need to add any oil. Keep checking on them and giving them a swirl around the tray to make sure they are toasted on both sides. When they are crisp to the bite take them out and serve them up. You will wonder why you ever threw them away! So what else can you make with pumpkins? •	Roasted in the oven with some butter and maple syrup or brown sugar. •	Mashed on its own (or with potatoes) with lots of black pepper and some butter. •	As a filling for pasta, pasties and rotis (the best I ever had came from a little newsagents shop in Fiji). •	But my all time favourite recipe for pumpkins is the mighty pumpkin pie! The UK is not big on pumpkin pie. It is near impossible to buy the usual canned pumpkin that many people use back in Canada or America. I have seen it in specialist stores but it usually requires a small bank loan just to purchase one can. Most of my friends in the UK make funny faces when I talk of my love for pumpkin pie (they start talking about weird North American foods like peanut butter and jelly sandwiches or egg-y waffles (eggo waffles) with maple syrup and crispy bacon). Maybe it’s the Canadian in me but it just doesn’t feel like Autumn without pumpkin pie. This year for Thanksgiving I was determined to make one from scratch. I thought it would be impossibly difficult, but I found the most amazing website which talked me through the whole process. I am not much of a baker but I am pleased to say the pie (well I actually had enough mixture for 2 pies!) came out beautifully. The website said that once you have tried pumpkin pie made from scratch you wouldn’t want to go back to the canned version and I absolutely agree! Please follow this link for their really easy to follow and fun to read recipe for the perfect pumpkin pie made from real pumpkin. For those of you who have never tried this wonderful dessert (usually served with whipped cream or vanilla ice cream) then give it a try. You will love it! Yummy Pumpkin Pie Made From Scratch. Well I have been back from Australia for just over 5 weeks now and I am still trying to get myself settled back into a daily routine. Fortunately Nutmeg hasn’t been having the same problems. Once we picked her up from the cattery and brought her home she hopped straight up onto the sofa wanting nose rubs and cuddles. All seems to be forgiven – which when dealing with cats is a good thing, however I am still sleeping with one eye open – just in case! The time spent with my parents was very special. My husband and I spent time in Sydney, Brisbane and Airlie beach. There were some wonderful trips to nature reserves where we saw some amazing (if not slightly terrifying) wildlife. We also helped my parents move house which was an adventure in and of itself. There were restaurant visits of course but what we really enjoyed was cooking together and sharing our meals at the dining room table. While my Dad and husband were in charge of making cocktails and occasionally throwing something on the barbeque, it was my Mum and I that did the majority of the cooking. She shared many wonderful recipes with me – some were old favourites that I hadn’t had since I was a child. Others like this muffin recipe were new to me. I have to say this muffin recipe is one of my favourites and I have made them several times since arriving back in the UK. They are so simple to make and are perfect for breakfast or as a healthy snack during the day. They are nothing like the ’cake’ style muffins we get here in the UK and I am delighted. If I wanted cake I would eat it – but muffins should taste like muffins! So here it is, my Mum’s Marvellous Muffin Recipe. Mix the Raisin Bran and All Bran in a large bowl and slowly add the milk. Gradually beat in the oil and egg. Mix the remaining ingredients (including the flour) in a separate bowl and gently stir into the cereal and milk mixture. Mix until everything is just moistened. Divide the batter evenly among the muffin tins. Bake for 15 – 20 minutes or until golden brown. Remove muffins and place on cooling rack. Enjoy for breakfast with some fruit yoghurt on the side or in the afternoon with a cup of tea! Greasing muffin tins is not only messy but it adds unnecessary calories to your cooking. 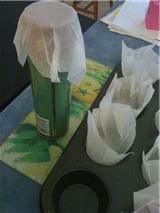 I have never felt comfortable cooking with parchment paper but my Mum showed me a really easy way to use it. You get a nice little ‘cup’ of paper that neatly slots into your muffin tin. Carefully spoon the batter into each cup. 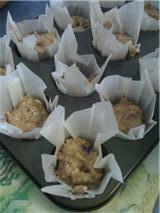 Once the muffins are cooked the parchment paper peels off really easily. There was no mess and no fuss! It is strawberry season here in Queensland Australia and I can’t get enough of this beautiful fruit! We visited a local farmer’s market in Mackay and stocked up. 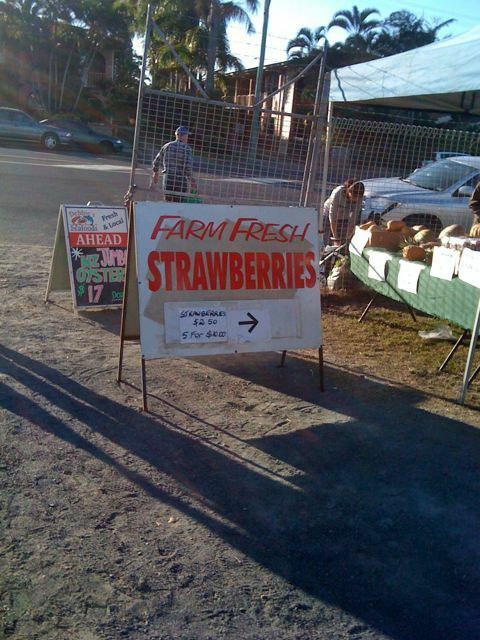 I have to say they are truly THE BEST strawberries I have ever tasted (sorry England). What I really love about these strawberries is that they are so juicy and flavourful you want to eat them just as they are. A delicious, wonderful gift from Mother Nature. I woke up this morning with a craving for scones and an urge to bake. The sun was streaming in the windows and the birds were singing loudly, it just seemed like the perfect morning to get in the kitchen and chuck some flour about the place. My husband has a love/ hate relationship with my baking. While he always appreciates the final product, it’s my somewhat haphazard approach (mainly my wild handling of flour) that offends his delicate Virgo sensibilities and his need for a completely spotless kitchen. When I mentioned scones I could hear the slight tremble of fear in his voice. To be honest it’s been so hot here that I almost didn’t feel energetic enough to make anything and I certainly didn’t want to clean flour off the kitchen counter, walls and floor (I really am a messy cook!). Fortunately I found a very simple scone recipe that is minimum fuss (and mess). It is courtesy of the BBC Food website and you can find it here. One big problem I had was that I only had plain flour in my cupboard and the recipe calls for self-raising. I wanted the scones so much that I decided to chance it – I just added a generous teaspoon of baking powder (plus a dash of wishful thinking). I was also feeling creative so I decided to add some cinnamon and raisins to the mixture as well. These scones are great as they don’t take long to bake at all – approximately 12–15 minutes. So by the time was husband wandered sleepily out of the bedroom the scones were made and on the wire rack cooling and the tea was steeping in the pot. There wasn’t even flour on the kitchen floor, which is saying something. O.K so they didn’t rise very much but they were very light and moist. The cinnamon came through nicely and combined well with the raspberry jam I served on the side. 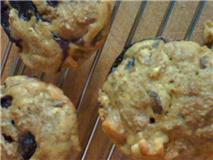 The raisins added some nice texture as well as additional sweetness. They went down very well with a pot of Clipper Everyday Tea and a morning episode of Burn Notice. 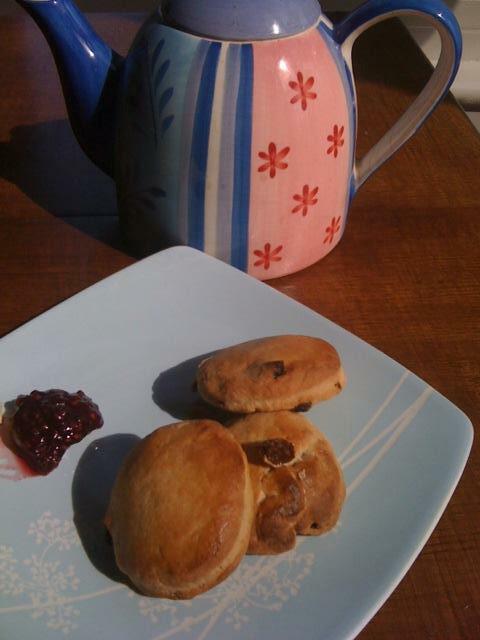 Scones are the easiest English teatime treat. There’s scope to customise these sweet ones with dried fruit or cinnamon. 1. Heat the oven to 220C/425F/Gas 7. Lightly grease a baking sheet. 2. Mix together the flour and salt and rub in the butter. 3. Stir in the sugar and then the milk to get a soft dough. 4. Turn on to a floured work surface and knead very lightly. Pat out to a round 2cm/¾in thick. Use a 5cm/2in cutter to stamp out rounds and place on a baking sheet. Lightly knead together the rest of the dough and stamp out more scones to use it all up. 5. Brush the tops of the scones with a little milk. Bake for 12-15 minutes until well risen and golden. 6. Cool on a wire rack and serve with butter and good jam and maybe some clotted cream. 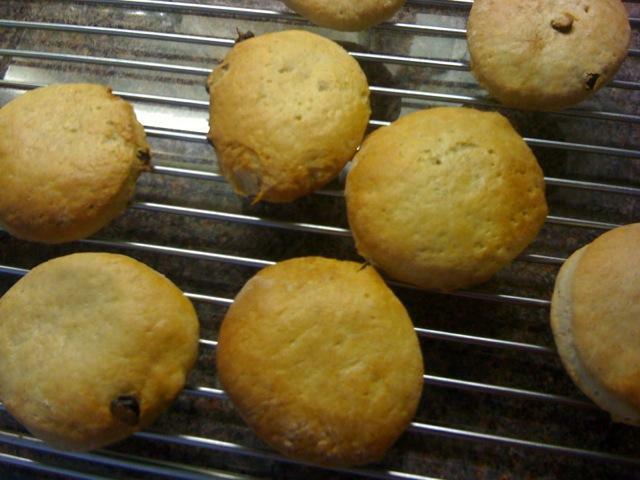 Cinnamon and Raisin Scones on the Cooling Rack. Since my husband or I don’t know how to drive, much of the Kent countryside has remained a mystery to us. There simply are some places we can’t get to via bus or train. As for cycling, I wouldn’t feel comfortable on the small winding country roads. When Jessica was here she rented a car and we were able to do some exploring! One of the highlights was discovering farmer’s markets and the many farm shops selling local produce. One such farm shop was in a lovely little town called Hadlow in Tonbridge. The shelves were full of home made pickles and jams. There was loads of fresh produce as well and some beautiful rhubarb caught our eye. Luna Raye’s Scrumptious Farm Shop Apple and Rhubarb Crumble. 3 large cooking apples peeled, cored and chopped into chunks. 3 medium sized rhubarb stalks, cut into chunks. 2 Tablespoons ground All Spice. 50 grams cold unsalted butter. 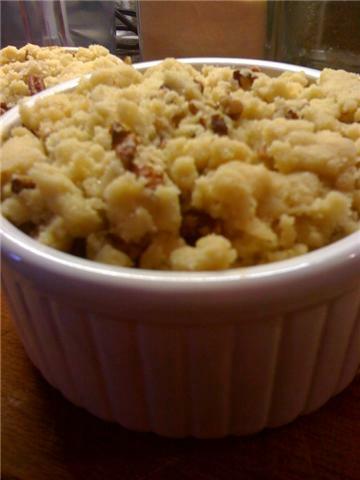 2 Tablespoons crushed pecans or walnuts. Place unsalted butter in a saucepan and add the chopped apples. Mix in the brown sugar and all spice and coat the apples. Add a splash of water if you need more moisture. 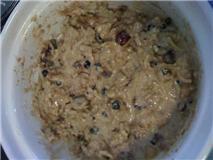 After 5 minutes or when the apples start to soften, add the rhubarb and sultanas and mix all together. When everything is nice and soft add to a large oven proof dish. Add the flour and granulated sugar into a bowl. Cut the cold unsalted butter into chunks and gradually add to the flour and sugar mixture. Use your hands to mix the butter in. You should end up with a mixture that is similar to bread crumbs. 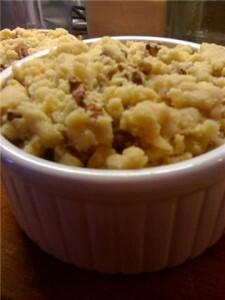 Add the pecans to the crumble topping before spreading over the apple and rhubarb mixture. Place in the oven preheated to 180 and cook for 30 – 45 minutes. Serve with a drizzle of cream or a scoop of ice cream and enjoy! As soon as I saw Giada De Laurentiis make this dish I knew it was the perfect dessert for the special Valentine day meal I am making my husband. I have been thinking about this recipe for months and am really excited to try it. 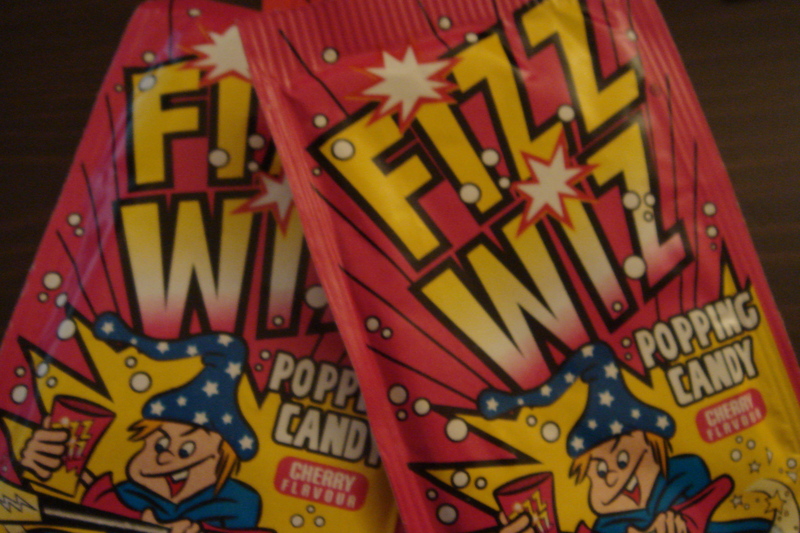 I have already bought the pop rocks and today fortunately managed to find some lovely raspberries. 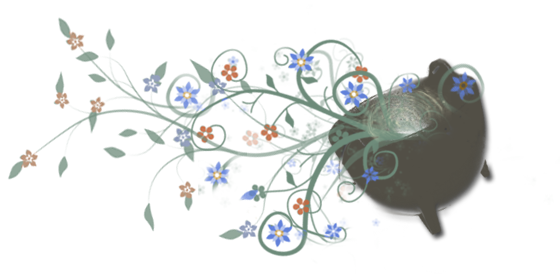 Otherwise I would have had to use blackberries, and I really don’t know if they would have worked as well. I will make the raspberry rose pots de crème today so they have plenty of time to set. The rest of my Valentine day menu includes a starter of Smoked Salmon with Prawns, Horseradish Cream and Lime Vinaigrette courtesy of Mary Cadogen. The main meal I am making is a classic French Canadian recipe for Tourtiere which is a meat pie. I haven’t had this dish in years and my husband has never even heard of it! I lived for many years in Quebec so thought it was about time I tried to make one of my favourite Canadian meals. I better make my way into the kitchen to start cooking, but first I may open a bottle of wine! Happy Valentine’s Day everyone! I will let you know how the meal turns out! Please let me know what tasty treats you prepared for your loved ones. Weekends should be a time when you can relax and unwind without feeling guilty. However sometimes it’s impossible to completely switch off, especially if you’re trying to balance your working week with extra curricular activities. At the moment I am studying Aromatherapy and do the majority of my work on the weekend. 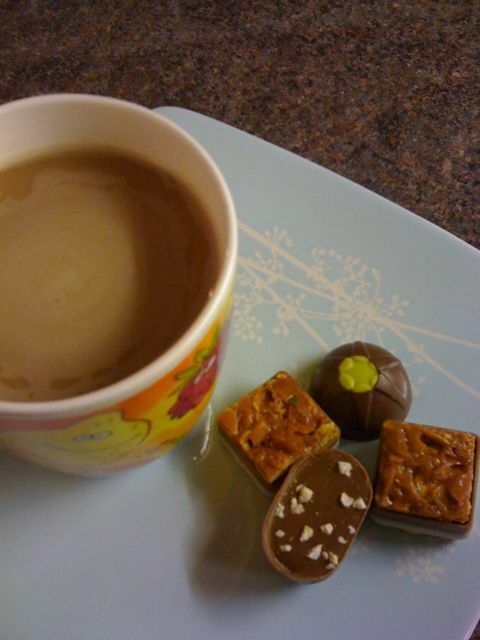 To help keep me going my husband will make me a special coffee and add a few treats on the side. Today he made an Americano which definitely put a spring in my step. He also put some chocolate truffles on the side. These ones from Hotel Chocolate really gave me my chocolate fix. The great news is my homework is done and I can now sit back and relax!